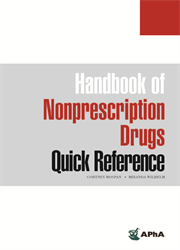 A practical tool for both practitioners and student pharmacists, the Handbook of Nonprescription Drugs Quick Reference provides a succinct summary of the most common self-care conditions for which community pharmacists provide treatment recommendations. Appropriate treatment recommendations are indicated based on the patient’s presentation, current medications, and chronic conditions. The Handbook of Nonprescription Drugs Quick Reference provides a succinct summary of the most common self-care conditions for which community pharmacists provide treatment recommendations. It presents the most essential information that is needed in the OTC aisle to assess if patients are candidates for self-care. Appropriate treatment recommendations are also indicated based on the patient’s presentation, current medications, and chronic conditions. The chapters are presented in the QuEST SCHOLAR-MAC format, providing a standardized process to help student pharmacists and practitioners quickly assess and treat their patients in the community pharmacy.